First published Canberra Times 28 August 2013. 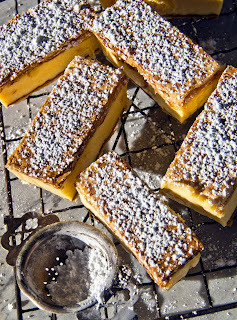 An oozy, vanilla custard cream layer, that squeezes out as you bite down, sandwiched between thin sheets of crispy, golden pastry topped with a dusting of icing sugar. 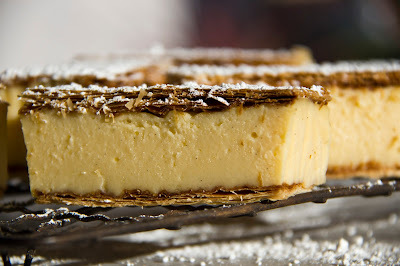 That slab of heaven is my ideal vanilla slice. With the jury still out after intense debate on what constitutes the real thing, I strive to match the quality of the finest French vanilla slice I’ve had in a long time. This accolade is not bestowed on a trendy patisserie in Melbourne or Sydney, but goes to Barnetts Bakery, nestled in the picturesque NSW north coast surfing village of Crescent Head. While holidaying in Crescent with the extended family in November last year, we rapidly develop a morning ritual based around our collective need for a decent coffee heart starter and a shared, growingly insatiable appetite for Barnett’s fabulous vanilla slice. Our morning scouts are sent down the hill each day to forage for these freshly baked pastry delights and half a dozen strong flat whites, with strict instructions to return post haste with the goodies and the day’s surf report. 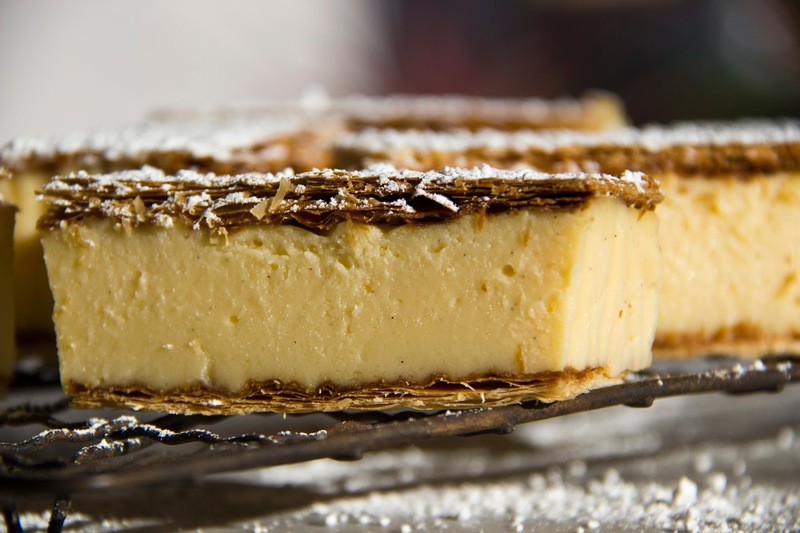 As the debate rages between enthusiasts of the French creamy, custard variety, versus the yellow rubber Aussie icon, my Napoleonic allegiance does not miss a beat - a heart beat that is. Trim both sheets of puff pastry to fit a rectangle slice tin, measuring twenty centimetres by thirty centimetres. Line the tin with non-stick baking paper, greasing lightly to hold the paper in place. Allow some overhang of the paper to provide a handle to lift out the slice when set. Place the two trimmed pastry sheets on a paper lined baking tray side by side. Leave a small gap between the two pastry sheets to allow room for spreading. Top with another layer of baking paper and place a tray on top of the baking paper to provide a weight on the pastry when cooking to reduce the pastry from rising and bubbling. Bake the pastry for fifteen minutes, checking for colour. They should be cooked to a light golden colour. 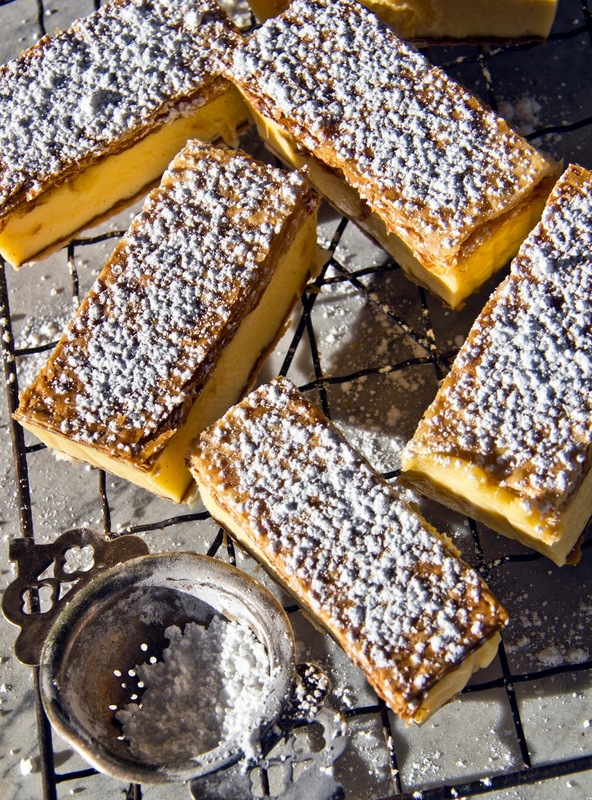 Cool on wire racks and make the vanilla custard filling. Place the cream, milk, sugar, butter and vanilla in a saucepan over a medium heat. Cook until the mixture is hot, but not quite boiling and remove from the heat. Mix the water and cornflour to a smooth paste, then whisk into the hot milk mixture. Add the beaten egg yolks and stir briskly. Return to a low heat, stirring continuously until the mixture thickens. Remove from the heat and allow to cool to room temperature. Place one of the cooked pastry sheets into the base of the lined slice tin, it should fit snugly. If the pastry sheet is too big, place on a flat board and trim carefully with a sharp knife to fit. Return to the tin and spread the cooled custard over the pastry. Top with the remaining pastry sheet, trimming to fit again if necessary. Fold the overhanging baking paper back over the top to enclose. Cover with plastic wrap. Refrigerate for at least two hours until set. To remove, carefully lift the overhanging baking paper and place on a board ready to slice. Peel away the paper. use a small sharp knife and cut only through the top layer of pastry, marking out ten, even sized slices. Then go back and slice the rest of the way down through the initial cut in the pastry, with a large, sharp knife until you hit the bottom layer of pastry and then push down to cut. My memory of the 70s is crammed with images of noisy, shared houses, furnished from Vinnies, with the compulsory turntable, massive speakers and walls lined by a million LPs in scavenged milk crates. Fashion crimes were abundant and often involved Indian toe thongs and wrap around maxi skirts. In the background of this joyous chaos was the usual large pot of red kidney beans and vegetables simmering atop the faded green Early Kooka. If you have something a little more exotic in mind for that tin of kidney beans lurking in the back of the pantry cupboard, then try these genius recipes. With kidney beans touted as a miracle food that claims to lower cholesterol, reduces the risk of heart attack, is high in iron, fibre and vitamins, I decide to increase our intake of these super legumes and reduce the amount of meat in our diet. The comforting Red Bean Curry is an authentic North Indian dish that is a snack to prepare and contains basic ingredients from the cupboard. Unlike many curries, you can make this in less than an hour. Just make sure you have plenty of fresh ginger on hand. 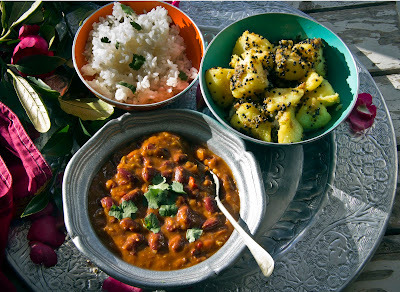 I spike the curry with extra chilli and serve it with Bombay Potatoes as a side dish. The recipe for Magic Bean Cake hails from a Thermomix recipe converted to a conventional method and requires the use of a food processor. You can make this cake using a blender and an electric mixer if you don’t have a food processor. Although this dense, silky cake is far from conventional, it is equally at home as a kids birthday cake or a dinner party dessert. Best served with creme fraiche. 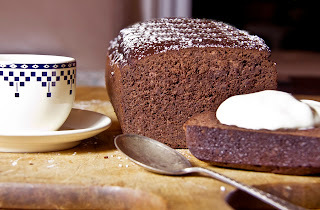 The added benefits of this cake is that it is low in sugar and is gluten free. 850g of canned red kidney beans, undrained. Heat the oil in a deep sauce pan over a medium heat for one minute. Add the ginger, garlic, onion, green chilli and mustard seeds and let sizzle for about one minute. Add the crushed tomato, salt and remaining spices and cook for an additional five minutes, stirring frequently. Add the undrained kidney beans plus one cup of water. Bring to the boil, then reduce the heat to medium and cook uncovered for ten minutes. Remove from heat and serve with Bombay Potatoes, boiled rice and naan. Top with a dollop of yoghurt and chopped herbs. Heat the oil in a frying pan on medium heat. Add the mustard seeds, chilli powder, turmeric and salt, stirring for thirty seconds. Add the chopped potatoes and fry for about four minutes, until the potatoes are smothered in seeds and have crispy edges. Reduce the heat and cover the pan, cooking for a further five minutes. Serve with the curry as an accompaniment. In a food processor, puree the kidney beans, coffee, one egg and vanilla until smooth. Set aside. Using the same bowl of the food processor, combine butter and sugar, processing until pale. Add the remaining eggs one at a time, processing until mixed after each addition. Add the bean mixture, then the sifted cocoa powder, salt, baking powder and bicarbonate of soda to the mixture, processing until mixed through and smooth. Pour the batter into a twenty-two centimetre greased round cake tin or a silicone loaf tin, baking for approximately thirty-five minutes. Leave the cake to cool in the tin before turning out. To serve, dust with icing sugar and a dollop of creme fraiche or yoghurt or topped with a cream cheese icing. First published Canberra Times 10 July 2013. Served in bistros all over France, this retro dish comes with its own crazy legend with Napoleon Bonaparte at its centre. Marengo is a town in northern Italy where, in 1800, Napoleon was victorious over the Austrians. This has been immortalised as the Battle of Marengo. The story goes that Napoleon’s chef, directed to come up with a suitably celebratory feast, whipped up a dish using ingredients that he was able to scrounge locally and named it Chicken Marengo to honour the decisive battle. Fortunately, some of the original ingredients such as scrambled eggs and crayfish haven’t survived to current versions of this recipe. Napoleon, with all his insecurities, needed constant reminders of his victory, so also named his horse Marengo. Given Napoleon’s temperamental nature, we can only hope that Marengo didn’t end his days in the cooking pot in yet another variation of this eponymous dish. So now that’s straight, my memories of this dish aren’t quite as auspicious as those above. Back in the 1960s when Mum wanted to impress at a dinner party, she would often trot out Chicken or Veal Marengo. It was served with a Napoleonic flourish, inside a ring of rice or buttered noodles, and we thought ourselves pretty sophisticated. I admit I haven’t really been able to figure out when veal replaced chicken, why crayfish and eggs were ditched or how and why mushrooms got involved. But the result is a hearty winter stew that is easy to make and delivers flavour considerably more than the sum of its parts. 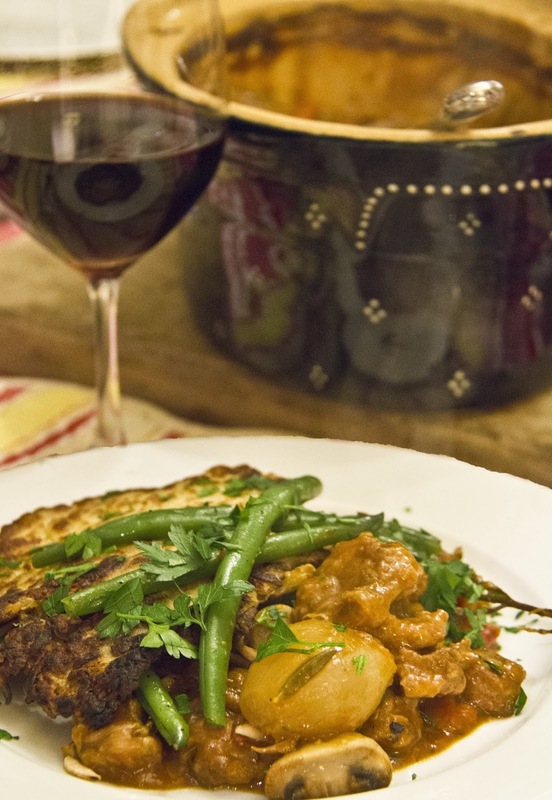 Made with veal, this dish is much richer and more complex than when made with chicken. Preheat the oven to 165C. Using a large ovenproof and stovetop proof casserole dish with lid, cut a round of baking paper big enough to fit the lid. This will reduce the amount of evaporation of juices while cooking. For this dish I usually use my Chasseur pot. Season the flour with salt and pepper and place in a large dish. Add the diced veal and roll to coat in the flour in batches. Shake off excess flour and set aside. To the ovenproof dish, add two tablespoons of olive oil and place over high heat. When hot, slip in some of the veal and fry in batches to not overcrowd the dish. Cook the veal cubes till brown and then transfer to a plate. Repeat with the remaining oil and veal. Wipe out the dish with paper towel, add the butter and place over medium heat. When hot, add the chopped onion and cook for about five minutes or until soft. Stir in the tomatoes, tomato paste, wine and herbs. Add the veal and stir, bringing to a boil. Check for salt and pepper, adding more if needed. Add the water, eschalots, mushrooms and potatoes and bring back to the boil. Once boiled remove the lid and place the baking paper circle on the top. Replace the lid and insert into the preheated oven. Bake in the oven undisturbed for forty-five minutes until the potatoes and onions are softened. Fish out the herbs and discard. Serve with a sprinkle of parsley and a potato rosti. If you feel inclined to replicate retro, you could serve this dish with buttered thick noodles or boiled rice. Parboil the potatoes whole with skin on in salted water until just tender, but not soft. Allow to cool and chill for a couple of hours. Once cooled, coarsely grate the potatoes and squeeze out any excess liquid. Place grated potato into a bowl and add flour, mixing to combine. Season to taste and add nutmeg. Heat half the butter and oil in a small heavy based frypan on a high heat. Add a heaped tablespoon of the potato mixture to the pan and press down with the back of a spoon to form a flat pancake. Allow to cook for a few minutes, shaking the pan to loosen the potato cake. When the cooked side is crispy and golden, using a spatula or egg lifter, carefully turn the rosti over to cook the other side until golden. Remove each potato cake to cool on paper towel. Serve with Veal Marengo as a side dish.